This is a double whammy of a dinner–It’s a Leftover meal as well as a Pumpkin meal! I had a ton of leftover quinoa from those Cilantro Orange Quinoa Tacos, and thought they would transform perfectly into a quinoa black bean PUMPKIN burger. Boy was I right! The extra flavor from orange and cilantro made an amazingly fresh burger, played nicely with the sweet nuggets of roasted pumpkin, and the quinoa developed a toasty, nutty flavor from cooking in the skillet. This made a perfect fall dinner! For these burgers, I used a regular orange pumpkin, nothing special, easily found in any patch. 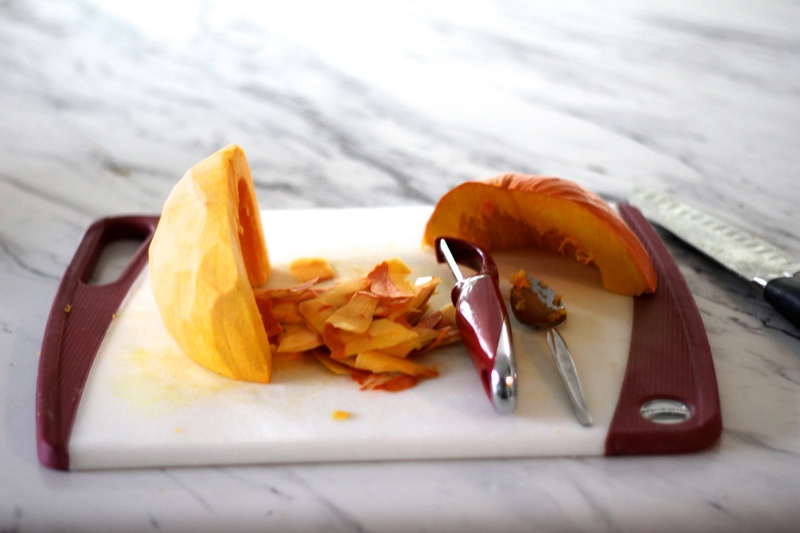 This one was definitely harder to cut and peel than the cinderella pumpkin–acting just like a “normal” winter squash. 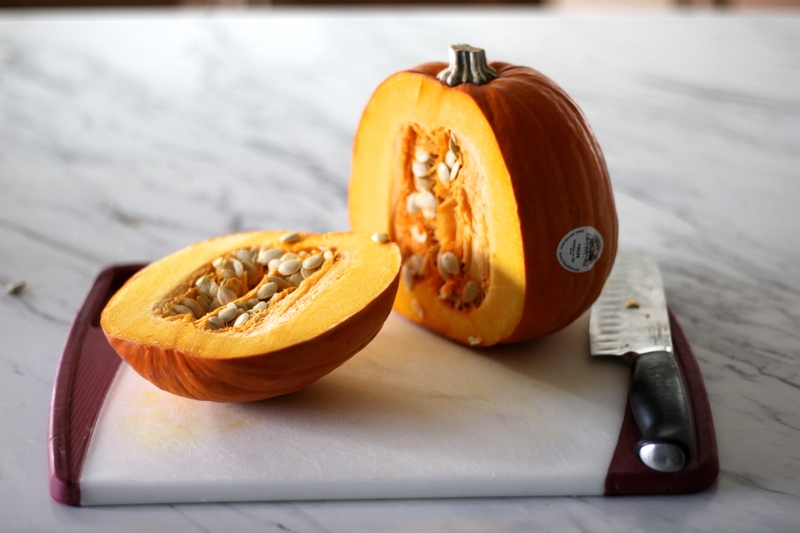 Peel and clean, and then dice up your pumpkin to pan-roast. I had 6 cups of quinoa, so the recipe reflects that amount. With 6 cups of quinoa, I used 4 cups of diced pumpkin. This made 7-8 burgers (based on how much you’re scooping); I cooked 4 to eat that night, and I froze the rest of the patties . Hi, my name is Michal, and I have a proportion problem: I ALWAYS cook more food than we eat that night for dinner. I either need to have more kids, or learn how to reduce cooking amounts. In the meantime, good things I transform leftovers into new yummy meals, or freeze the rest for quick weeknight dinners later. Just mix up the quinoa, pan-roasted pumpkin, bread crumbs, and eggs, and form your burgers in equal-sized patties. If you want to keep it vegan, substitute ground flax seed and water (see recipe). So easy. 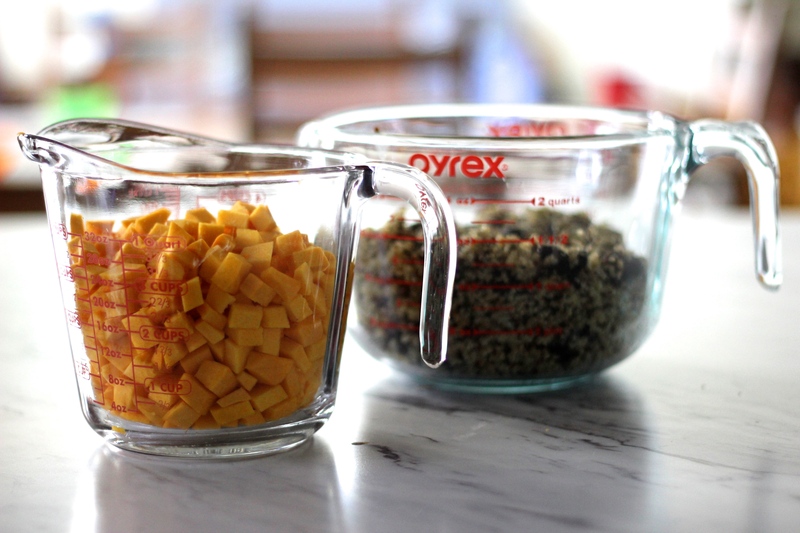 Cook the cilantro orange quinoa, if you don’t have leftovers. Coat the bottom of a medium pot with olive oil and heat to medium. Saute the onion, garlic, and jalapeño until the onion is soft and translucent. Add the quinoa and saute until it is dry and slightly toasty. Add the orange “stock”, zest, and cilantro. Let come to a boil and then turn down the heat to low and cover the pot. Let simmer for 15-20 minutes, until the stock has been absorbed and the quinoa is cooked through. You’ll know the quinoa is done when the seed has turned sort of translucent. When the quinoa is done cooking, turn off the heat, add the black beans, and stir. Cover and let rest. 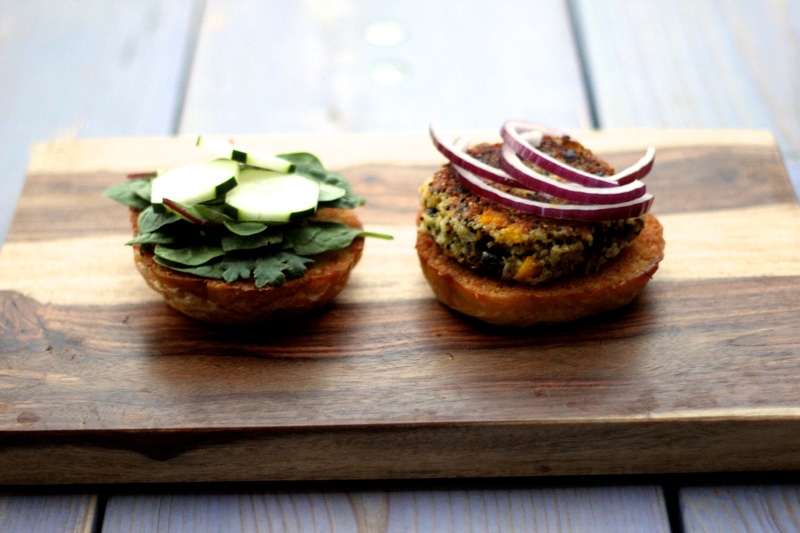 If you already have leftover quinoa, start on this step to make your burgers. Coat a large skillet with olive oil and heat over medium to medium-high heat. Add your diced pumpkin and salt and pepper to taste and saute until the pumpkin is golden and toasty. Prepare a cookie sheet with parchment paper to place your burgers on while they are waiting to be cooked. 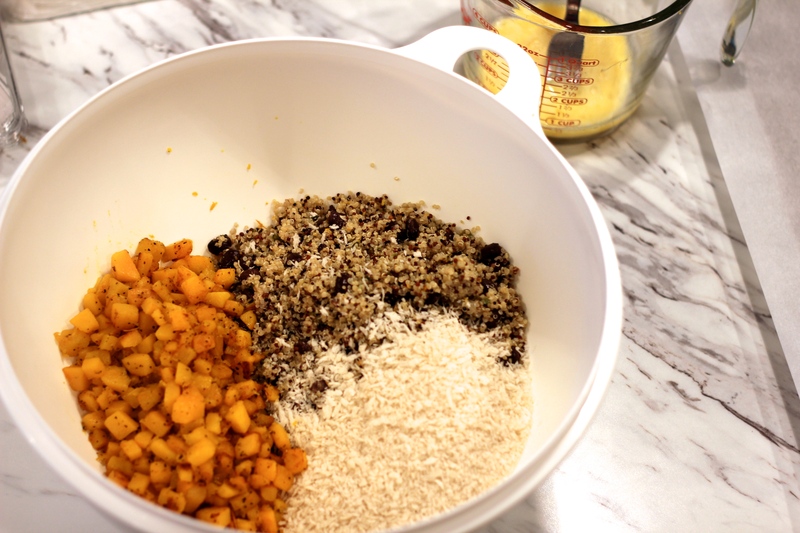 Add the quinoa, pan-roasted pumpkin, breadcrumbs, and eggs in a large bowl, and stir until well combined. For easy, same-size burger patties, I use a #6 scoop. 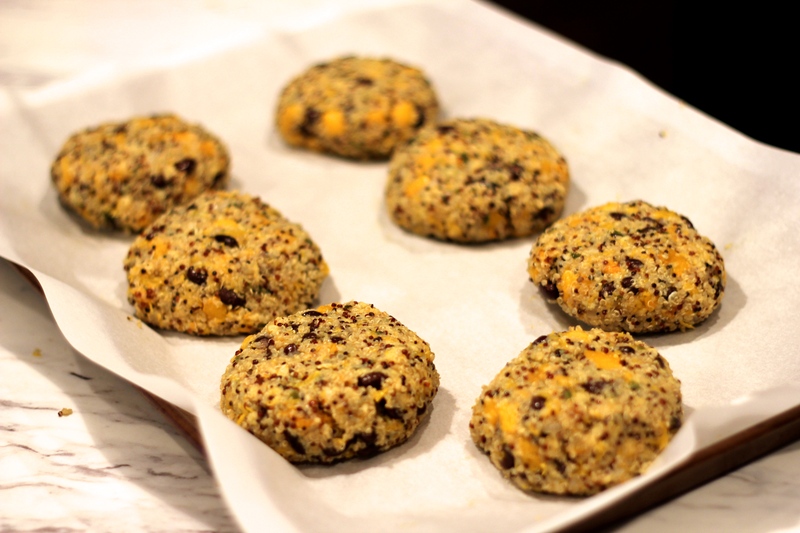 Scoop the quinoa pumpkin mixture, and press firmly into a tight ball, then gently flatten on the cookie sheet. Even with the bread crumbs and eggs as binding, these burgers are a little delicate. They will firm up as you let them rest on the cookie sheet, or putting in the fridge for a few minutes will also help. Coat a large skillet with olive oil (you can use the same skillet you used to pan-roast your diced pumpkin) and heat over medium heat. Cook 4 burgers at a time, browning each side, about 5-7 minutes total. Serve with toasted hamburger buns, and fav burger toppings of choice. Next > Pumpkin. It’s What’s For Dinner.